By the author of the New York Times bestseller, Love Poems for Married People, and the Thurber Prize-winner Truth in Advertising comes a wry yet tenderhearted look at how one man's public fall from grace leads him back to his family, and back to the man he used to be. While American viewers may have loved and trusted Ted for decades, his family certainly didn't: His years of constant travel and his big-screen persona have frayed all of his important relationships. At the time of his meltdown, Ted is estranged from his wife, Claire, and his adult daughter, Franny, a writer for a popular website. Franny views her father's disgrace with curiosity and perhaps a bit of smug satisfaction, but when her boss suggests that she confront Ted in an interview, she has to decide whether to use his loss as her career gain. And for Ted, this may be a chance to take a hard look at what got him to this place, and to try to find his way back before it's too late. 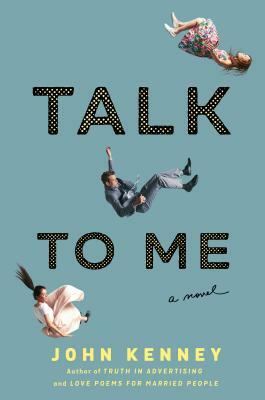 Talk to Me is a sharply observed, darkly funny, and ultimately warm story about a man who wakes up too late to the mess he's made of his life... and about our capacity for forgiveness and empathy. John Kenney is the author of Truth in Advertising, which won the Thurber Prize for American Humor in 2014. He has worked as a copywriter in New York City for seventeen years. He has also been a contributor to The New Yorker magazine since 1999. Some of his work appears in a collection of The New Yorker's humor writing, Disquiet, Please! He lives in Brooklyn, New York.